Stout men considering moving to China should be prepared some direct critiques from the country's ad agencies. Though you may think you're just slightly overweight, that package of “Fat Guy Briefs” in your shopping cart dares to accuse otherwise. It's not just one manufacturer, either, and this has to do with the brutally honest Chinese product description being translated into English without the application of diplomacy. Take the package above, from Huilu. 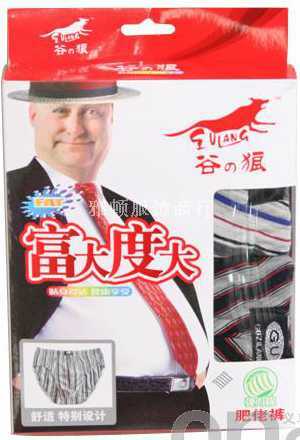 It's labeled size 4XL and features a photo of a rather, er, substantial Caucasian man (because evidently there are no obese men in China). 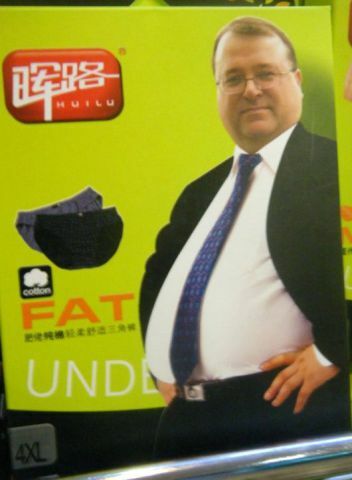 The package copy reads 肥佬纯棉轻柔舒适三角裤, which translates to “Fat guy, pure cotton, soft, snug briefs.” Those first two characters are pronounced FEI LAO, which if heard in your general vicinity on a Chinese street means it's time to consider a weight loss program, pronto. The term is far from accidental and China's advertisers are anything but shy when using it. The descriptive copy for Men's Fat Guy Briefs (left) at the Yadun Garments Firm website quotes the phrase “Men's Fat Guy Briefs” no less than 7 times in an 8-sentence paragraph – in fact, the phrase leads off the first 7 sentences. Talk about rubbing it in! Our favorite sentence in the copy: “Men's Fat Guy Briefs are very comfortable to wear with moderate elasticity and perfect buttocks lifting effect, being suitable for men to wear.” The briefs may be comfortable but suddenly we're not.